Symbiosis Entrance Test 2019 - Candidates aspiring to join BA LLB/ BBA LLB / B.Des./BCA/BBA (IT)/BA (Mass Communication) /B.Sc. (Economics) Hons./BA (Liberal Arts) /B.Sc. (Liberal Arts) /B.Sc. (Culinary Arts) /B.Tech Programs offered by Institutes of Symbiosis International (Deemed University) have to take the common, mandatory online Computer Based Test (CBT), Symbiosis Entrance Test (SET) 2019. 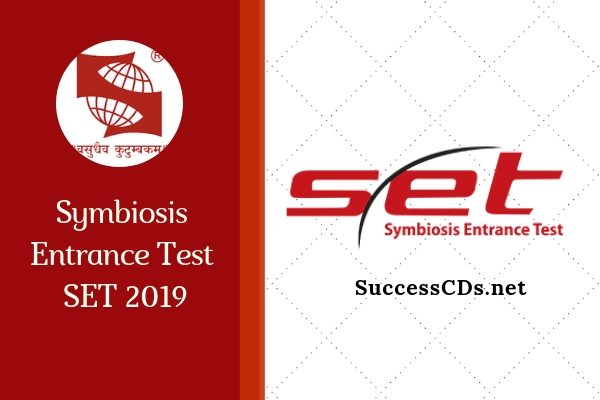 Since 2019, SET - Law test is known as Symbiosis Law Admission Test (SLAT), SET - Design test, as Symbiosis Entrance Exam for Design (SEED), SET - Engineering as SIT Engineering Entrance Exam (SITEEE) and SET - General as SET. These are conducted in Computer Based Test (CBT) mode across various cities of India. The Symbiosis Institute of Technology (SIT) also admits students through JEE Mains conducted at the national level. Note: Candidates who are applying to Symbiosis Institute of Technology (SIT), Symbiosis Institute of Health Sciences (SIHS), Symbiosis School of Nursing (SCON) and for Symbiosis School of Photography (SSP) should visit their respective institute website for further details. SLS - BA LLB Hons. & SLS - BBA LLB Hons. : Standard XII (10+2) or equivalent examination passed from any recognized board with minimum 45% marks (40% marks for Scheduled Caste/Scheduled Tribes). Symbiosis Law School - Noida [SLS - BA LLB] / [SLS - BBA LLB]: Standard XII (10+2) or equivalent examination passed from any recognized board with minimum 45% marks (40% marks for Scheduled Caste/Scheduled Tribes). Symbiosis Law School - Hyderabad [SLS - BA LLB] & [SLS - BBA LLB]: Standard XII (10+2) passed from any recognized board with minimum 45% marks (40% marks for Scheduled Caste/Scheduled Tribes). SCMS - Pune: Standard XII (10+2) or equivalent examination passed from any recognized board with minimum 50% marks (45% marks for Scheduled Caste/Scheduled Tribes). SCMS - Noida: Standard XII (10+2) or equivalent examination passed from any recognized board with minimum 50% marks (45% marks for Scheduled Caste/Scheduled Tribes). SICSR - BBA/SICSR - BBA: Standard XII (10+2) or equivalent examination passed from any recognized board OR equivalent government approved diploma (10+3) with minimum 50% marks (45% marks for Scheduled Caste/Scheduled Tribes). SID: Standard XII (10+2) or equivalent examination passed from any recognized board OR equivalent government approved diploma (10+3) with minimum 50% marks (45% marks for Scheduled Caste/Scheduled Tribes). SIT: Standard XII (10+2) passed from recognized board with Physics and Mathematics as compulsory subjects along with one of the Chemistry/ Biotechnology/ Biology/ Technical Vocational subjects. Obtained at least 45% marks (40% in case of candidates belonging to Scheduled Caste/Scheduled Tribes) in the above subjects taken together. SCMC: Standard XII (10+2) or equivalent examination passed from any recognized board OR equivalent government approved diploma (10+3) with minimum 50% marks (45% marks for Scheduled Caste/Scheduled Tribes). SSE: Standard XII (10+2) or equivalent examination passed from any recognized board with minimum 50% marks (45% marks for from any recognized board with minimum 50% marks (45% marks for Scheduled Caste/Scheduled Tribes). However, OCI/ PIO/ Foreign Nationals are exempted from appearing for SET/SLAT/SEED/SITEEE 2019 and have to apply through Symbiosis Centre for International Education www.scie.ac.in. For details regarding OCI/PIO/NRI/FN admission process, please refer to Sub Section I: Process for International Candidates. Negative Marking: There is no negative marking for SET. Institutes: The constituent institutes use scores of the following details for admission. Timing: 2.30 pm to 5.00 pm. Defence Quota: 5% for SLS - PUNE, SICSR and SCMS - Pune. Candidate applying for the above- mentioned categories will be required to submit the supporting documents at the time of PI- WAT/ST - PI. Candidates applying for Defence Quota other than above maintained three institutes (SLS- Pune, SICSR and SCMS - Pune) will be considered as candidates in OPEN Category. Differently Abled (DA) candidate means a candidate having any of the disabilities in accordance with the Persons with Disabilities Act 1995 and as per revised Gazette of India. Also see: MBA after Graduation or Work Experience Which is better? Note: No change of test city requests will be entertained once candidate has completed payment for SET/SLAT/SEED/SITEEE 2019. A candidate desirous to submit his candidature to select UG Programs, is also required to complete the payment process of desired program before the closing date of payment of the same. Payment towards the programs must be made through the website only (set-test.org). After making the payment for SET/SLAT/SEED/SITEEE, proceed to complete the online registration form (Part II) for Program (s) registration and the respective institute(s). A candidate is required to make separate non-refundable payment of Rs.1000/- per Program per institute at this stage. If candidates want to pay program payment through Demand Draft, make Demand Draft of Rs.1000/- for each program in the name of Symbiosis Test Secretariat. No changes shall be permitted after closing date under any circumstances. No requests for change of test city or category will be entertained once candidates have completed their Online SET/SLAT/SEED/SITEEE 2019 payment. You may register for one paper in the morning (for example, SET-Law (SLAT) or SET-Design (SEED), and/or one paper in the afternoon session (for example, SET-General (SET) or SET-Engineering (SITEEE). The candidate may pay through i) Billdesk Payment Gateway ii) Easebuzz Payment Gateway iii) Indian Bank Payment Gateway iv) Demand Draft. Pay the Entrance Test Fee of Rs.1750/- for each test. If you are registering for one test in the morning (SLAT/SEED) and one test in the afternoon (SET/SITEEE), the fees are Rs. 3500. Please note that last date of payment is 15th April 2019. The Symbiosis Test Secretariat will authenticate the details of Demand Draft and will send you an email confirming the payment. Only after the realisation of payment, would you be able to view your Admit Card. Important: SET/SLAT/SEED/SITEEE 2019 fee is non-refundable and non-transferable. SET/SLAT/SEED/SITEEE 2019 Score will be valid only for admission to select Programs of Symbiosis International (Deemed University) for the academic year of 2019-20. IGNOU Result for December 2018 Term End Exam declared, Check Result! KCET 2019 Application Process begins, Apply Now!